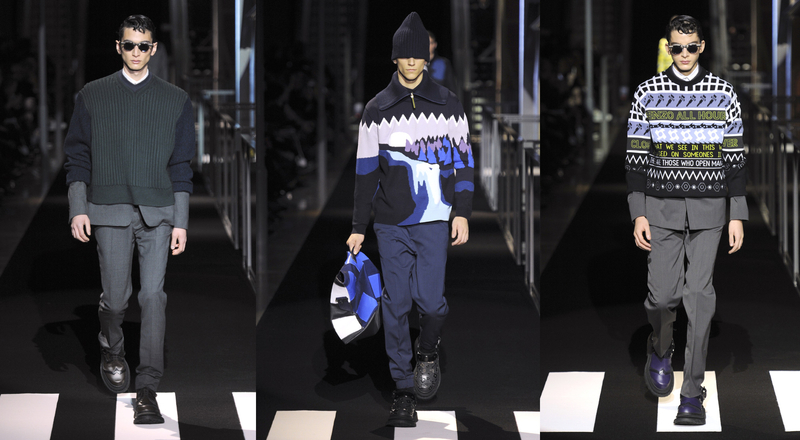 From Milan to Paris, a recap of the Fall/Winter 2014 menswear creations from our Houses: Fendi, Marc Jacobs, Louis Vuitton, Givenchy, Berluti, Kenzo and Dior Homme. The starting point of the collection, says Silvia Venturini Fendi, Creative Director for menswear of the eponymous fashion House, was the idea of functional. She believes a man’s wardrobe is only truly elegant if the clothes move fluidly with the person wearing them. For Fall/Winter 2014, this inspired timeless pieces including gray flannel suits and deep-toned cashmere sweaters, set off by accessories, which play a key role in creating a sophisticated allure. Marc Jacobs sent out 70s inspired menswear silhouettes for next winter, referencing the looks of forever young icons like Bryan Ferry or Jack Nicholson. These inspirations were present throughout the collection, from flamboyant peacock prints to suits with baggy pants and extra-long jackets, and a velvet tuxedo. 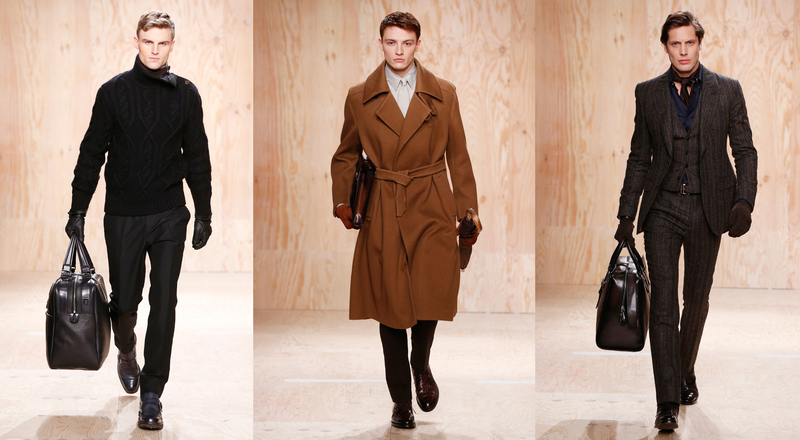 Coats in sumptuous fabrics were emblematic pieces in the collection, finishing the silhouette with elegance. With an unquenchable thirst for travel and discovery, the Louis Vuitton man takes us to the Atacama Desert, a vast untamed mineral expanse in northern Chile. Menswear Creative Director Kim Jones shares his vision of a chic adventurer. From formal wear to trekking garb and reversible cashmere coats, the collection once again creates an enticing invitation to travel. 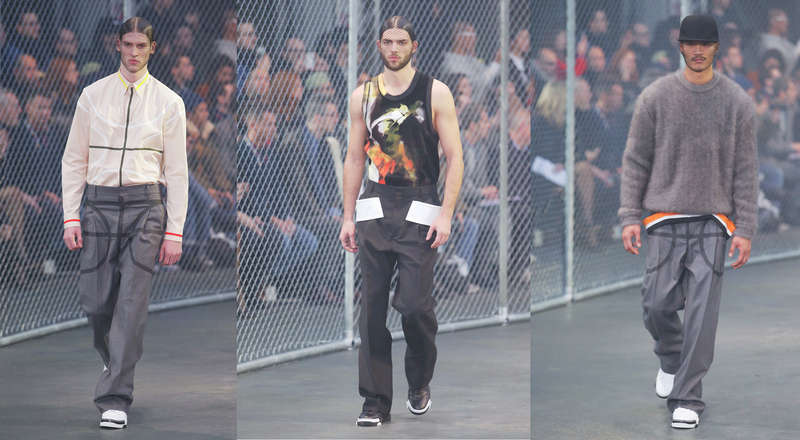 At Givenchy, streetwear meets a more formal wardrobe in a dialogue sometimes engaged in the same look: baggy leather suits, printed shirts, monochrome jackets, tone-on-tone patches, intersecting lines, curves and primary colors… The décor and certain emblematic pieces in the collection bounced back and forth in a setting inspired by the world of basketball. After several seasons of shows featuring tableaux vivants, Berluti took to the catwalk for a collection that showcased stunning creativity and savoir-faire. In addition to an exclusive shoulder pleat for greater ease of arm movement, there was two-sided cashmere, a bathrobe inspired vicuña coat, plus monochrome silhouettes with innovative finishing and details. 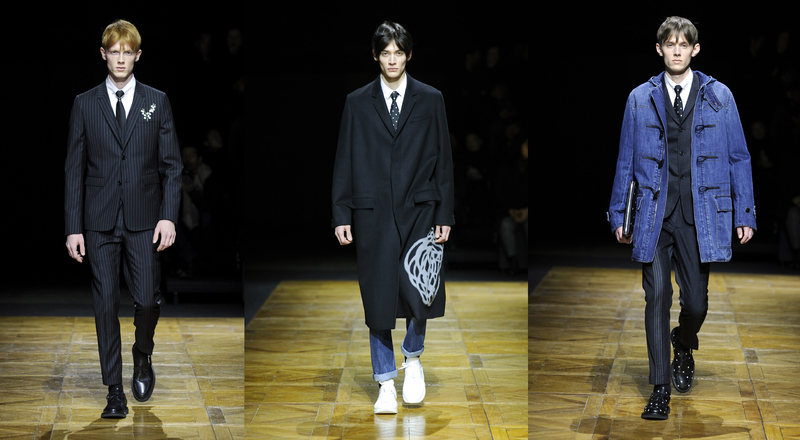 The wardrobe presented by Creative Director Alessandro Sartori is masterfully sleek. Kenzo once gain affirmed its mastery in the art of superposition. 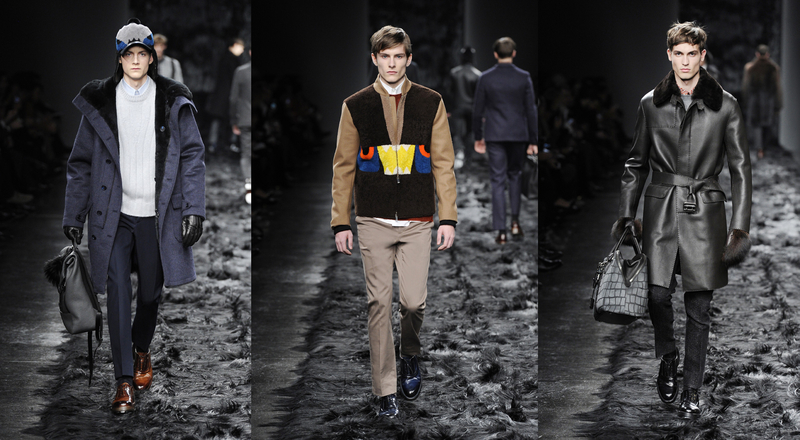 Short sweaters were worn over suit jackets, boldly destructuring the silhouette. As always, the highly visual prints—both geometric and landscape-inspired—took us to Northern California, an ever-fertile source of inspiration for Creative Directors Carol Lim and Humberto Leon. The clothes proposed by Kris Van Assche for next winter debuted with a series of three-piece striped flannel suits with a very Savile Row feel, a nod to Monsieur Dior’s taste for classic London tailoring. Then he gradually introduced denim, the ambassador of casualwear par excellence, in myriad forms: vests, shirts, pants and a duffle coat all energized the silhouettes. Christian Dior’s much loved flowers were also given a high profile, embroidered atop a jacket pocket or in all-over appliqué on pants.